An economical, easy to setup, high performance projector with features that ensure long life and low maintenance. Create a perfectly aligned display with 3D Keystone technology, a new four-corner geometry correction tool. This easy-to-use feature allows you to quickly configure your image, ensuring a geometrically accurate display for every presentation. The Christie LX505 presents exceptional image quality using advanced LCD technology that utilizes inorganic 3LCD panels. These inorganic panels have been designed for improved lifetime performance over conventional 3LCD panels. With a 1000:1 contrast ratio and 10-bit video processing, the Christie LX505 produces natural, smooth color tone to ensure picture stability and flawless video playback… a quality image every time. Christie LX505 provides XGA resolution at 5000 ANSI lumens, an ideal brightness level for medium-sized venues. 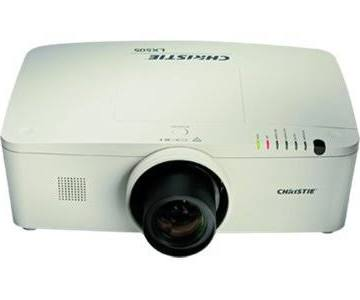 You can easily add the Christie LX505 to a network of projectors via the built-in network port. This unit offers complete pro AV compatibility by accepting signals from a variety of sources. The long-life AutoFilter cartridge system and up to 3000 hour lamp (economy mode) ensures low cost of ownership over the life of the product. The Christie LX505 offers the latest in LCD technology enhancements in an affordable, easy-to-use package.